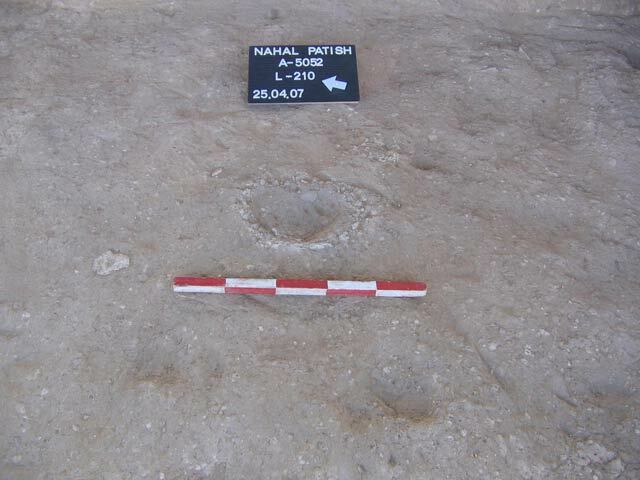 During March–May 2007, a trial excavation was conducted at the site of Nahal Paṯṯish (Permit Nos. A-5052, A-5108; map ref. 174253–317/579764–927), prior to the installation of a gas line. The excavation, undertaken on behalf of the Israel Antiquities Authority and underwritten by the Israel Natural Gas Line Company,was directed by P. Nahshoni (field photography), with the assistance of Y. Lender (administration), A. Hajian (surveying and drafting), T. Sagiv (field photography), the ‘Sky View’ Company (aerial photography), and S. Talis and E. Aladjem (probe trenches). The Nahal Paṯṯish site is located c. 12 km northwest of the Chalcolithic-period sites in Be’er Sheva‘ and c. 9 km east of a site from the same period at Gilat (Fig. 1). The site extends across an extensive area along the northern bank of Nahal Paṯṯish, on a broad terrace at the base of a ridge of hills. Mining had damaged the site in the past. Three excavation areas (A–C) were opened along the route of the planned pipeline. Four squares were excavated in Area A (Permit No. A-5052), the southern of the three areas, after ancient remains had been discovered in probe trenches. Areas B and C (Permit No. A-5108) were opened north of Area A, following the discovery of ancient remains while overseeing the trench digging for the gas pipeline. Three squares were excavated in Area B and one square (5.0×5.5 m) in Area C. Remains of underground dwellings and habitation levels that dated to the Chalcolithic period were exposed. Installations and bell-shaped pits were discovered in the underground dwellings, whose walls and entrances were built of fieldstones and mud bricks. Two settlement phases from the Chalcolithic period were discerned in Areas A and C. A surface paved with wadi pebbles, which dated to the Byzantine period, was uncovered in Area A. The Chalcolithic Period—Early Phase. A dwelling complex (L161, in access of 3×6 m; Fig. 2) dug in the loess was exposed. The entrance to the complex was set in the southern side, nearest the wadi channel; it was reached by way of a stone-built corridor and staircase (Fig. 3). 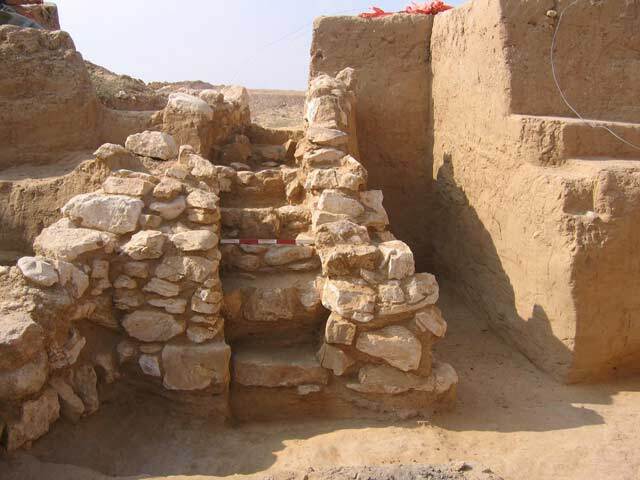 The complex was enclosed on the east by a stone wall (W6; length 3.8 m, width 0.6 m, preserved height 0.61–1.25 m) that separated it from another dwelling complex (L171), located to the east.Installations built of wadi pebbles and fieldstones (diam. 0.8–0.9 m, preserved height 0.44 m) were found in the middle of Complex 171, next to its sides. The complex was apparently covered with a loess ceiling. The southern part of the roof was probably supported by the eastern W6. Patches of ash, which were discovered in the southern part of the complex, indicated some activity that involved burning; therefore, it is assumed that an air vent was cut in the roof. This part of the complex was covered with levels of refuse from the Chalcolithic period that had accumulated after part of the ceiling collapsed and the dwelling complex was no longer in use. Only a small amount of ash overlaid the floor in the northern part of the complex and probably not ventilation hole was in the ceiling above it. The fill above the floor in the northern part was clean loess, almost devoid of any finds, which apparently was swept over there. 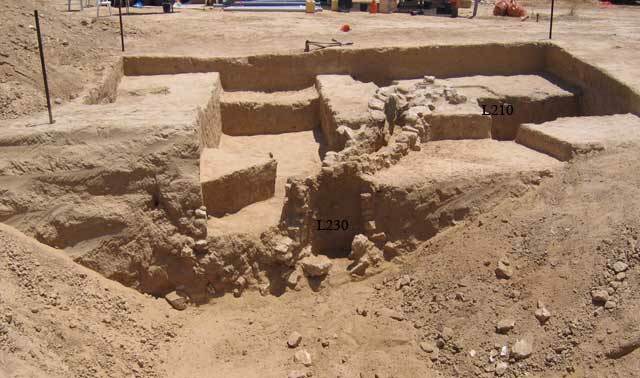 The western boundaries of the dwelling complex were only partly exposed due to the limited scope of the excavation. The southern end of Complex 171 was enclosed by a mud brick wall that abutted W6 from the east. A small bell-shaped pit was cut in the floor of the complex. 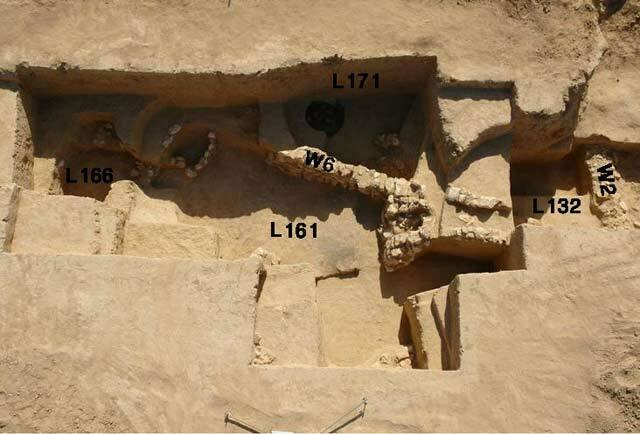 An opening cut in the loess led from the main area of Complex 161 to a room located to its north (L166). Room 166 seems to have been entirely dug in the loess and only its western part was excavated (1.7×2.0 m). Remains of another area (L132), which had been mostly eroded away, were exposed south of Complex 161. This space was enclosed on the south by the scant remains of a wall (W2). The Chalcolithic Period—Late Phase. A habitation level, which contained a few pottery fragments that apparently belonged to the latest occupation phase in the Chalcolithic period, was discovered on the surface. Byzantine Period. A pavement of wadi pebbles (0.4×1.2–1.7 m) was exposed on the surface, southeast of Complexes 161 and 171. Several potsherds dating to the Byzantine period that apparently dated the pavement were discovered nearby. An entrance corridor (L230; preserved length 4 m; Fig. 4), dug in the ground and lined with fieldstones, was discovered; it sloped to the west and led to an underground cavity that had been damaged by the work on the gas pipeline and therefore, was not excavated. All that was preserved of the underground cavity was a thick ash level, discerned for a distance of c. 6 m in the section of the gas pipeline trench. Southeast of the entrance to the underground cavity was an occupation level, which yielded a considerable amount of ash (L210) and above it were round installations of clay, which had been slightly fired as part of their use (Fig. 5). These were probably small forges used in copper industry; although no copper remains were discovered. A bell-shaped pit (diam. c. 2 m, depth 1.5 m), which contained pottery vessels, stone objects, flint artifacts and loaf-shaped mud bricks from the Chalcolithic period, was exposed south of the entrance to the underground cavity. The Chalcolithic Period—Early Phase. An occupation level that included ash and artifacts (L316) was exposed; it may have belonged to an underground complex that lay outside the excavation area. The Chalcolithic Period—Late Phase. An occupation level (L314), which contained remains of stone-built installations, was exposed.The collapsed stones discovered in this phase indicate that Level 314 apparently belonged to a structure, which was partly built of stone.In addition, a bell-shaped pit (L317) that severed the previous occupation level and was probably associated with the later occupation level was exposed. Remains of a large settlement that was inhabited for a long time during the Chalcolithic period were exposed. The pottery vessels and flint artifacts recovered from the excavation dated to the Be’er Sheva‘/Ghassulian cultures. 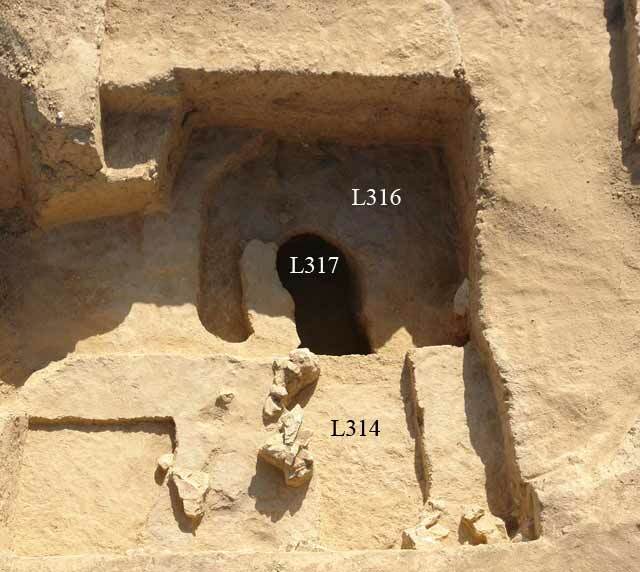 The architectural features at the site, including subterranean structures dug in loess, are also similar to those exposed in the sites of that culture in Be’er Sheva‘. It seems that only limited activity was conducted at the site during the Byzantine period. 1. 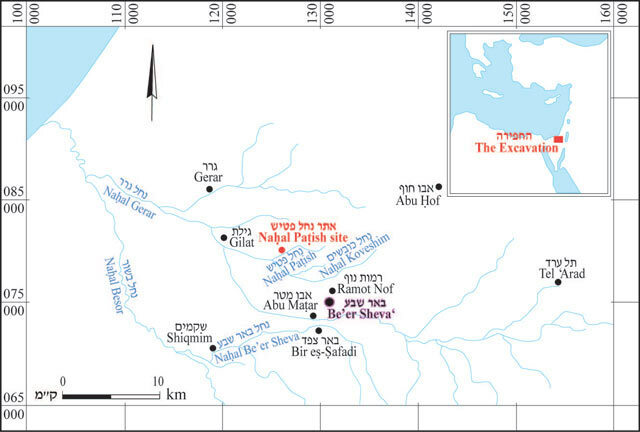 Map of the sites from the Chalcolithic period in the Be’er Sheva‘ region. 2. Area A, an underground complex, looking east. 3. Area A, a staircase leading to an underground complex, looking south. 4. Area B, a built corridor, looking east. 5. Area B, a small forge (?) on a floor. 6. שטח C, מבט למזרח.